• A new free exhibition featuring 60 Londoners photographed in front of an historic building or special place to them opens in Kings Cross on Monday. The Historic England exhibition I am London features well-known Londoners, such as reproductive health expert Professor Lord Robert Winston, philosopher AC Grayling, feminist activist and journalist Caroline Criado Perez, artist Bob and Roberta Smith, designer Morag Myerscough and performer Amy Lamé as well as “unsung Londoners” – everyone from a Yeoman Warder at the Tower of London and the park manager at Kensington Gardens to a 7/7 paramedic, an apprentice at a Savile Row tailors and a student at the Royal School of Needlework – in telling stories which illustrate how the city’s heritage can be “inspirational, provocative, frustrating, fun, familiar, humbling and home”. Taken by Historic England photographer Chris Redgrave, the photographs will be displayed in the UAL Window Galleries at Central Saint Martins along with a selection of objects the sitters chose to be photographed with, including the Pearly King of Finsbury’s jacket, Bob and Roberta Smith’s ‘Vote Bob Smith’ badge and a submarine once owned by Morag Myerscough’s father. Can be seen until 4th September. For more, see https://historicengland.org.uk/get-involved/visit/exhibitions/i-am-london/. 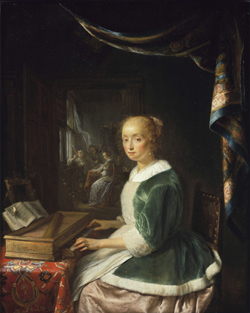 • Two of 17th century Dutch painter Gerrit Dou’s finest works – Woman playing a Clavichord and Lady Playing a Virginal (pictured), both dating from about 1665 – have been reunited for the first time in 350 years at the Dulwich Picture Gallery in south London. Opening this week, Dou in Harmony examines how Dou created two distinctly different takes on a similar subject and will be accompanied by a contemporary sound installation in the Mausoleum. Composed and played on the viola da gamba by Liam Byrne, the modern piece takes its cue from 17th century music and aims to evoke the mood of Dou’s paintings. The display is the latest in the Making Discoveries: Dutch and Flemish Masterpieces series which showcases four artists from the gallery’s collection: Van Dyck, Rubens, Dou and Rembrandt (whose work will be featured in an upcoming display in November). Runs until 6th November. Admission charge applies. For more, see www.dulwichpicturegallery.org.uk. • Georgia O’Keeffe’s celebrated work, Jimsyn Weed, White Flower No 1 (1932), is among highlights at the major retrospective of the US artist’s work which opened at the Tate Modern this week. The display marks a century since O’Keeffe’s debut in New York in 1916 and, with none of her works in public collections in the UK, provides a “once-in-a-generation opportunity” for audiences outside the US to view her portfolio of works in such depth. The display features more than 100 major works and charts the progression of O’Keeffe as an artist over a span of six decades. Runs until 30th October. For more, see www.tate.org.uk. I have always been besotted with Dou. So why did it take till now to get two of his loveliest works, Woman playing a Clavichord and Lady Playing a Virginal, together again. Good on you, Dulwich Picture Gallery!